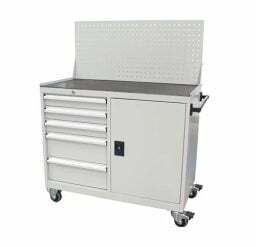 Our range of industrial tool trolleys provide a great storage cabinet solution for your workplace. The Industrial Tool Cabinet Workstation has 5 drawers with each drawer able to hold 100kg each. This means you can organise your bulky and heavy tools into lockable drawers to maximise security and keep your workspace tidy. 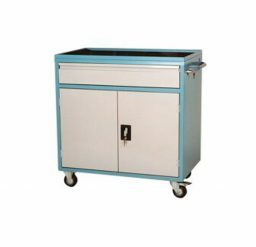 The Tradesman Trolley features lockable drawers and cupboards and a top plate with a rubber ribbed mat. Keep your workspace clean and in turn, safe! With your tools tucked away neatly in drawers and cupboards you’re able to work safely without any nearby trip hazards. This way, you can spend more time on the job at hand, and not trying to remember where you last put down your tools. Maximise efficiency and safety, all while using the space in a clever way. Our range of quality tool trolleys are great for small spaces and even work well in large warehouses or workshops as they can be transported with the wheels, however these can be locked when you’ve decided on a location for the tool trolley. Krosstech have been supplying high-quality industrial tool trolleys for Australian businesses for five decades. We have solutions for a range of different industries, not only in warehouses and for construction but also in schools and medical environments. Our products are trusted as they are designed strictly in accordance with Australian Standards to ensure your safety. Safety is something we take very seriously so we always ensure each product meets the standards. We want you to be working in a safe environment, maximising space and efficiency- with the industrial tool trolleys- this is achievable! 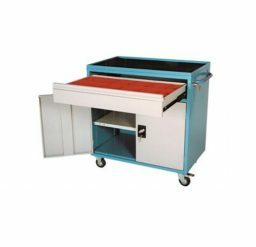 Our range of industrial tool trolleys will allow you to incorporate a cost-effective solution to your industry’s needs. You can trust that our products are reliable and safe. Give us a call if you have any questions regarding our industrial tool trolleys and we will assist you in making the right choice.